Thrifty By Design: Fun in the sun! I've been outside most of the weekend - visiting the local thrift shops, sewing (a bit inside, a bit outside) and refinishing projects. Thankfully I'm getting some stuff done! I lucked out this week. I went to the Lions Gate Hospital Thrift Shop (128 West 15th Street) and picked up some sample Danica placemats for $1/each then some sample paper napkins at 3 for $0.10. I spent $8.30 and got 8 placemats and 9 paper napkins. My finds were the envy of my coworkers! 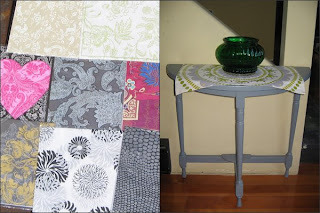 I used one of the placemats for my newly refinished end table. 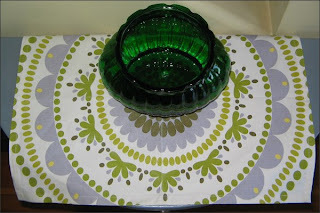 Then I picked up a couple of glass containers at the Salvation Army for $1.50/each - I've placed one on the table with one of the funky placemats. The paper napkins will be perfect for potential decoupage projects. 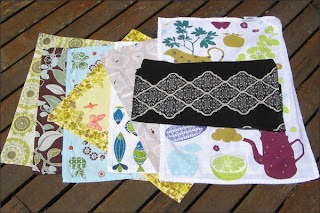 I'm going to use a couple of the placemats for my wall organizers. I picked up some canvas at Fabricland - it was a remnant piece so I scooped it for $3. It should be enough for 2 wall organizers using the hangers from the canvas wall hanging I picked up awhile ago. The canvas will be the main piece and the placemats I'll use for the pockets. I had so many compliments on the pillow cover I did for a friend's baby shower that I made another cover. 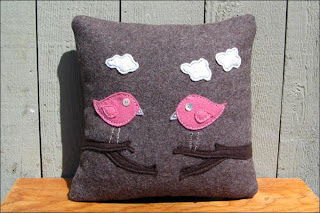 This pillow is for my friend Heather who wanted one using pink, brown, cream and turquoise.